Heat oil in a Dutch oven or stock pot to medium heat. Add onion, celery and carrot and saute 8-10 minutes, until soft. Stir in garlic, then sausage and saute 7-8 minutes, until sausage is browned, using a spatula to break it into pieces. Stir in oregano, spinach leaves, salt and peppers and saute until spinach has wilted, about 3-4 minutes. Add chicken stock and bring to a simmer. Add tortellini and cook 6-7 minutes, until tortellini is cooked. In a small bowl, whisk together evaporated milk and corn starch until dissolved. Pour mixture into the pot and simmer 3-4 minutes, until thickened. Taste and adjust seasoning, if necessary. 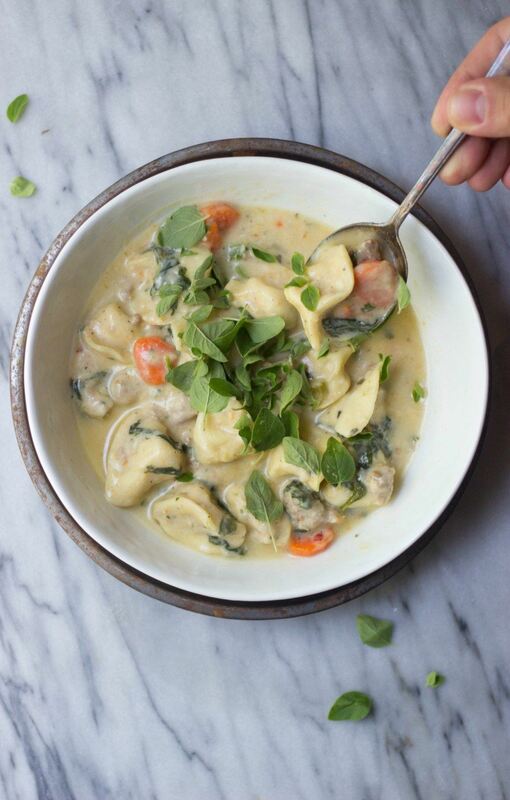 Spoon into bowls and top with Parmesan and greens or fresh herbs, if desired.